There are several products manufactured to facilitate the transferring onto and off of a toilet safely and to make using the toilet more comfortable. Transferring to a toilet is probably the most difficult transfer a wheelchair user has to contend with on a regular basis. With other types of transfers the wheelchair user will have options on placement of their wheelchair and/or the piece of furniture they are transferring to. With a toilet they are stuck with the position of the toilet and often have no options on where to position their wheelchair for the transfer. In addition to the flip-up bar and floor-to-ceiling pole listed on our grab bar page, there are other products specifically designed for use when toileting. 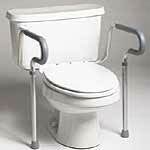 Versa frames, or toilet safety frames as they're sometimes known, are common pieces of equipment to aid a user who stands when accessing the toilet. These frames are attached to the toilet with a bracket which secured by the bolts which hold the toilet seat on. Once this bracket is installed, the removable arms of the toilet frame lock into the bracket. The arms of the versa frame, which are aluminum, are quite strong when the downward pressure is applied while lowering onto the toilet seat or pushing off the seat. These arms are not very strong if side pressure is applied such as when a wheelchair user would pull themselves across from their wheelchair. There are two types of products which are called toilet elevators and while they both acheive the same end, they do work a little differently. The first type of toilet elevator which I'm referring to is bolted to the toilet bowl between the existing toilet seat and the bowl and elevates the existing toilet seat only. This is similar in design to a raised toilet seat but because it is bolted onto the toilet, it tends to be a bit more secure. A toilet versa frame can still be used with the toilet elevator. Although this model of toilet elevator can be removed and taken with the user if they should change residence it can't really be considered transportable. One issue which one needs to be aware of with this type of toilet elevator is that there are different shaped toilet bowls. When purchasing this type of toilet elevator the buyer must know whether the toilet it will be used on has a round or elongated bowl. 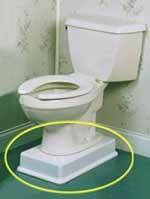 The second type of toilet elevator is installed underneath the toilet and elevates the whole toilet. This model of toilet elevator actually bolts to the floor instead of the toilet and the toilet bolts to the toilet elevator. This is probably the most secure way of raising a toilet and, as far as I know, it will work with every make of toilet available in North America regardless of bowl shape. 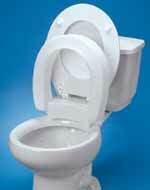 Of course, the toilet's original toilet seat will work and a toilet safety frame will also work with this product. The one drawback that I can see with this product is that some knowledge of plumbing is required. To install this elevator, the toilet must be removed, breaking it's drain seal, and the water supply must be disconnected. To install, longer bolts must be inserted in the floor flange, an extension for the drain must be installed with new seals, the toilet must be mounted on the elevator and a longer water supply tube installed. While all this sounds like a lot of work, it isn't necessary to hire a plumber if there is someone handy around with a basic knowledge of how toilets work and how to install them. All the parts required to do the installation are included when you purchase this product. All toilets come with hard plastic seats which are okay to sit on for short periods of time. Conventional padded toilet seats, which can be purchased from many retail stores, will fit onto many toilets however, for those who need more pressure relief while sitting on the toilet than a conventional padded toilet seat can provide, this air cushion may be the answer. When properly inflated, this cushion will provide the highest amount of pressure relief possible for a user of a commodeor toilet. When under inflated, it will offer very little pressure relief and will be a waste of money. So, if someone is available who is willing and able to maintain the air pressure at the proper level in this product, it's a great product to prevent pressure sores created by sitting on a hard toilet seat and provide comfort for the user. Gel commode pads provide pressure relief for commode or toilet users but don't require any maintenance such as maintaining the air pressure in air type commode pads. These pads can be cut and modified as needed and resealed. Gel commode pads are about 1" thick and don't create the high seat height that an air cushion will, making it a little easier to transfer on and off the toilet for users who don't stand to transfer.